The most immense power wielded in this play is the statement "I do forgive." Mistress of a "full poor cell." Yeah, right. 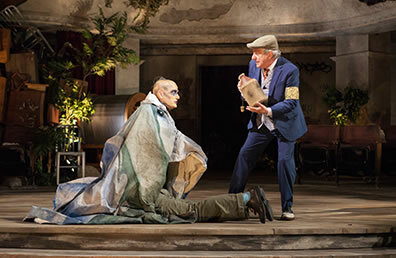 Prospera (Kate Burton, left) gives instruction to Ariel (Philippe Bowgen, right) as Miranda (Nora Carroll) sleeps in The Old Globe's production of William Shakespeare's The Tempest, directed by Joe Dowling on a set depicting a ruined movie palace designed by Alexander Dodge. Photo by Jim Cox, The Old Globe. 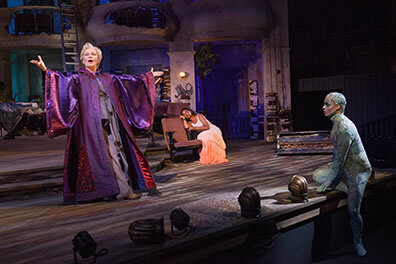 Prospera's abode on the mysterious island of William Shakespeare's The Tempest is the cluttered remnants of a mid-20th century movie palace in Joe Dowling's production at San Diego's Old Globe. Curve-walled balcony box seats create a Mediterranean-style façade. The concrete is crumbling in places and the island's natural elements—ferns, vines, and pebbled sand—are reclaiming their territory. Gold-cased footlights line the front of the stage, one of them toppled, a couple others broken. Theater seats are scattered about. Books are stacked on one side. There's an old piano here, a wood dress form there, a podium holding a book, a telescope, two ladders, and a huge pile of junk, such as chairs, a typewriter, a candelabra, and a mop. Graffiti, "Sycorax" and "HBD," adorn the walls. A ship's wheel is at the center of the stage, a wind machine sits at the back. This set designed by Alexander Dodge is the kind of stage scenery a well-endowed theater uses to wow! audiences and sometimes distracts from the art being plied by playwright and performers. In this production, the cast of accomplished actors keeps the focus on Shakespeare's masterful story. The scenery also proves practical for a play that explores family bonds, social bonds, and humankind's bond with nature. Native islander Caliban (Manoel Felciano) makes his home inside that pile of junk, and Prospera (Kate Burton) treats the room as her home office. A rotating platform in the middle of the two-level wood-planked stage has a slanted surface: as it turns, it becomes a ship's bow, a promontory for Prospera to cast her spells, and the moving earth of the first meeting between love-smitten Miranda (Nora Carroll) and Ferdinand (Sam Avishay). 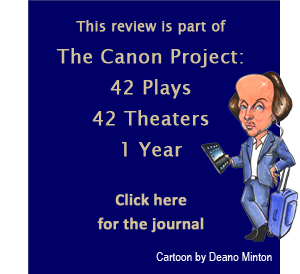 The setting presents an allegorical foundation for Dowling's staging of Shakespeare's comedy about political power lost and natural powers gained, of revenge and forgiveness. The latter is made most poignant by the performances of Emmy-winning and Tony-nominated Burton in the lead role and longtime fave René Thornton Jr., appearing in his fifth production of The Tempest, as her brother Antonio. Dowling employs a metatheatrical framework with the first scene when the ship, bearing Alonso, the King of Naples (Robert Foxworth) wrecks in a storm, all of which we discover in the play's second scene is just an illusion. This production opens with three early 20th century uniformed sailors, one carrying a metal sheet (for thunder), one with a tray of sand, and the third working the wind machine. Enter Arial (Philippe Bowgen), toe-to-neck in bluish body suit with a random pattern of glittering lines down to his gloved fingertips and his blue sparkling hair slicked back. He's carrying a torch that he hands to the ship's captain as more crewmembers arrive. Arial then leads the crew in a finger-snapping, body-slapping sequence that leads into the storm. The king and his courtiers gather on stage and, with little dialogue, fling themselves back and forth across the stage in the violent storm a la Star Trek's Enterprise under attack. As the nobles and crew scatter, Prospera appears behind them wearing a shimmering purple and metallic burgundy robe and carrying her staff. We're not done with the opening scene yet—only delayed. We move into the play's second scene, in which Prospera recounts her back story to daughter Miranda: how 12 years before, Antonio usurped her as Duchess of Milan with Alonso's aid; how a charitable Neapolitan councillor, Gonzala (Lizan Mitchell) supplied books from Prospera's library before the conspirators cast mother and daughter to sea; how they landed on this island. As Prospera tells their story, each of the characters appears on different balconies, Thornton's Antonio listening with intense arrogance as his sister describes his deed. Prospera's books were sorcery textbooks, and Prospera used her studied skills to survive and thrive by commanding the elements (Ariel and his fellow spirits) and Caliban, the offspring of the witch Sycorax with grimy green skin and wearing a flimsy green shirt and pants plus a padlocked chastity belt (costumes designed by David Israel Reynoso, who dresses Prospera and the king's court in modern European fashions). Now, Prospera's usurpers have come within her reach, and she'll use her magical powers to regain her political powers and exact revenge on her brother. After Prospera puts Miranda to sleep, she calls on Arial to report on the faux storm and shipwreck. Instead of describing it, per script, Bowgen's Arial invites his lady to sit and observe, and as Burton takes one of the theater seats on the stage, the entire first scene is played in its entirety with the dialogue restored. Prospera is watching the show with us. Now familiar with the characters, we can note their personalities confirming Prospera's report. Casting a woman as Prospero and even regendering the part (as is Gonzalo as Gonzala and Alonso's attendant Francisco as Francisca) has only one significant consequence: it gives superior talents like Burton (and Helen Mirren in Julie Taymor's film) the opportunity to play this fascinating role. Except for switching pronouns and title, the only time regendering factors into the staging is when Gonzala is philosophizing on the island as a utopic society where there would be "no occupation: all men idle, all; and women, too," that last addition inspiring Francisca (Yadira Correa) to gesture an emphatic "Yes!" Does a mother's perspective differ from a father's in the character's relationship with Miranda? I, a one-time stay-at-home father, consider any such generalizations as sexist. Shakespeare offers actors of both genders a golden opportunity to explore the parent-child relationship of a single, worldly wise parent raising a worldly naïve daughter from toddler through puberty to teen in the sparest of conditions. In the 18 Tempests I've seen (plus the film), what I can say unequivocally is that the Prospero-Miranda relationship has many different dynamics to explore, and Burton and Carroll, like so many before them, plant their own flag in this territory. Burton establishes Prospera's parenting perspective in her very first lines. After Miranda, fearing for the "poor souls" in the shipwreck, begs Mom to cease the storm, Burton's Prospera cuts her off with a business-like "Be collected; no more amazement. Tell your piteous heart there's no harm done." Prospera is concentrating on her work and doesn't want to be annoyed by her daughter's baseless fear. "O woe the day," Miranda replies, and now Mom softens: How could Miranda know her fear was baseless? "No harm!" Burton's Prospera says again, this time in a comforting tone. "I have done nothing but in care of thee, of thee." And this is true; Prospera is dealing with a work-life balance here though her work is all to the purpose of providing her child security and opportunity. Carroll plays the teen-age Miranda with natural intelligence, a girl who knows her mom all too well. As Prospera uses her magical powers to disarm Alonso's son, Ferdinand, and threaten the prince with further harm, Carroll speaks Miranda's interjection, "O dear mother," in an annoyed rather than frightened tone. "Make not too rash a trial of him, for he's gentle and not fearful," she says, like, it's obvious, right? "What?" Prospera replies; "I say, my foot my tutor?" a bit peeved by her kid's brashness but not raging. Of course, Prospera is engineering this scene to match her daughter with the Neapolitan prince. Later, with affectionate pride Prospera spies on the two trading vows of love and respectfully turns her gaze away when they kiss. Prospera's parenting persona plays into her relationship with Caliban, too, not present but past. Caliban, recalling Prospera's affection toward him when she first arrived on the island, settles into a nostalgic tone. "And then I loved thee," he says plaintively. It was acting on his lust for her daughter that got him in trouble and wearing a chastity belt. Their relationship arc, through to his recognizing his redemption at the end, is that of the prodigal son. Yes, she treats Caliban as a slave and calls him so, but she forces Ferdinand to do the same task she gives Caliban, carrying wood, until the prince earns her trust. How often have I heard parents describe their kids as slave labor. Arial, on the other hand, is not a slave. "Thou report'st thyself" as slave, the magician retorts when he complains of too much work. Nor is he a surrogate child. Their relationship is more, well, theatrical. When Ariel demands Prospera to keep her promise—their contract, as it were—she throws a hissy fit, calling him a "malignant thing." When he excitedly references where once "Thou call'dst me up at midnight to fetch dew from the still-vex'd Bermoothes," Burton looks at him with a vacant expression; she doesn't recall what he's talking about. What many directors approach as the play's great conundrum, Arial suddenly asking, "Do you love me, master? No?" is no heavy matter here. Bowgen plays this line as intentionally cute, as in, "Don't you just luv me, master?" "Dearly, my chick," she responds approvingly. When Ariel plays the harpy in a vision to vex Alonso and his lords—and what a harpy, with red feathers for fingers and a big beak—Burton incorporates a lecturing tone in her praise of him: "Bravely the figure of this harpy hast thou perform'd, my Ariel; a grace it had, devouring: Of my instruction hast thou nothing bated in what thou hadst to say." Sounds to me like a director's notes. Prospera's own redemption, however, is not an act, though beautifully acted by Burton. For all the love and care and humor she expresses for Miranda and Ferdinand, and toward Arial when she's pleased with his work, she's unrelentingly mean to Caliban, and her behavior borders on sadistic toward Alonso and his court. Standing amid the stupefied lords after that harpy business, Burton's Prospera revels in how "My high charms work, and these mine enemies are all knit up in their distractions; they now are in my power." She's behaving like a Batman villain. "In these fits I leave them, while I visit young Ferdinand—whom they suppose is drown'd—and his and mine loved darling." The dashed italics are mine, or, rather Burton's, for she speaks this phrase directly to the entranced Alonso in the same hoity tone we've witnessed in her brother, Antonio: you think your son is drowned, but I know he's alive and hooking up with my daughter, a-hole. She becomes crazed in her vexation at the end of the pageant she stages for Miranda and Ferdinand (a glam show with the goddesses in shimmering silver gowns and cube frames on their heads singing "Going to the Chapel of Love"). She asks Ariel the time of day, and he replies that it is the sixth hour, at which time, "You said our work should cease" (he tracks his hours, doesn't he?). "I did say so, when first I raised the tempest," Prospera replies, Burton revving up the sinews of her countenance as the moment of vengeance is at hand. Hatred has fully consumed her hitherto genial behavior in this scene to the point that she dismisses Ariel's pity in his description of the lord's state when he suggests that, if she saw them now, her "affections would become tender. ""Dost thou think so, spirit?" she replies, challenging him to again question her authority. "Mine would, sir, were I human." Burton halts as she replies, "And mine—shall." She is not playing this with great psychological effort. It's more as if Arial just slapped the demon out of her, leading to the realization that forgiveness is the greater virtue and her truer self. 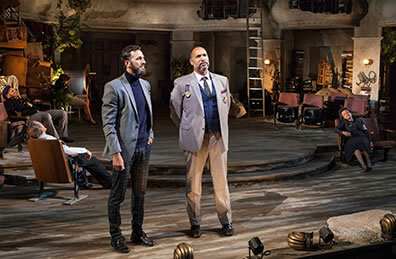 Top, Sebastian (Daniel Ian Joeck, left) and Antonio (René Thornton Jr.) plan a coup as King Alonso and his party sleep in Shakespeare's The Tempest at the Old Globe. Above, Stephano (Robert Dorfman, right) offers wine to Caliban (Manoel Felciano), who is sitting on top of the hiding Trinculo (Andrew Weems). Photos by Jim Cox, The Old Globe. The proof of this realization plays out in the final scene of reconciliation, she with Alonso, Alonso with his supposed drowned son, Caliban with his mistress, and Miranda with the world. The elephant in the scene is Antonio. "For you, most wicked sir, whom to call brother would even infect my mouth, I do forgive thy rankest fault; all of them," Prospera tells him. Burton pauses a moment before pronouncing her forgiveness, perhaps checking in with herself for one more "are you sure?" perhaps for dramatic effect. She also plays the semicolon well, realizing in the moment that all his faults are "rankest" and all must be forgiven unconditionally. Well, one condition: "And require my dukedom of thee, which perforce, I know, thou must restore," she adds. Shakespeare keeps Antonio silent through 260 lines of reconciliations and wondrous revelations: Ferdinand is alive! He's betrothed to Prospero's daughter! The ship is not wrecked after all! Only when Caliban arrives with the king's drunk butler, Stephano (Robert Dorfman) and jester Trinculo (Andrew Weems), self-abused in their intent to murder Prospero and take over the island, does Antonio speak his only line in the entire scene, and that is a reply to Alonso's brother, Sebastian (Daniel Ian Joeck) making fun of Caliban. What is Antonio doing all the while? Many productions depict him already scheming to overthrow Prospero again; some present him resigned to his state and maybe even grudgingly giving Prospero respect. Thornton does something mightier with Antonio. Having been in four previous productions of The Tempest, including playing Prospero at the American Shakespeare Center in 2016, which topped my rankings of that year's Shakespeareances, Thornton sees that the most immense power wielded in this play is the statement "I do forgive." Thornton's Antonio is astonished—even if he doesn't fully comprehend his sister's magical powers or yet know that she's already knit a familial alliance with Alonso. How can somebody forgive what he did? He spends his lines of silence taking this in as he watches in wonder as Prospera's power of forgiveness creates a brave new world. The final reconciliation is brother to sister. And it is a true one. The set has one more surprise for us. As Prospera sets Arial free, the walls at the back of the stage open up, revealing the wooded ravine running behind this outdoor theater in San Diego's Balboa Park. The baseless fabric of this vision, the gorgeous palace, dissolves into thin air, like Prospera's "insubstantial pageant." Except that there's nothing insubstantial about her pageant.